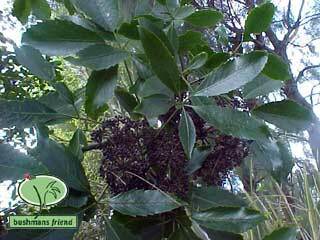 Use this guide and the photos and images to help identify common New Zealand flowering native trees and shrubs. This is not a definitive guide but describes the more common flowering trees and shrubs you may encounter in the wild or at a garden centre. Browse the list below if you know the species name, or follow links for more information. 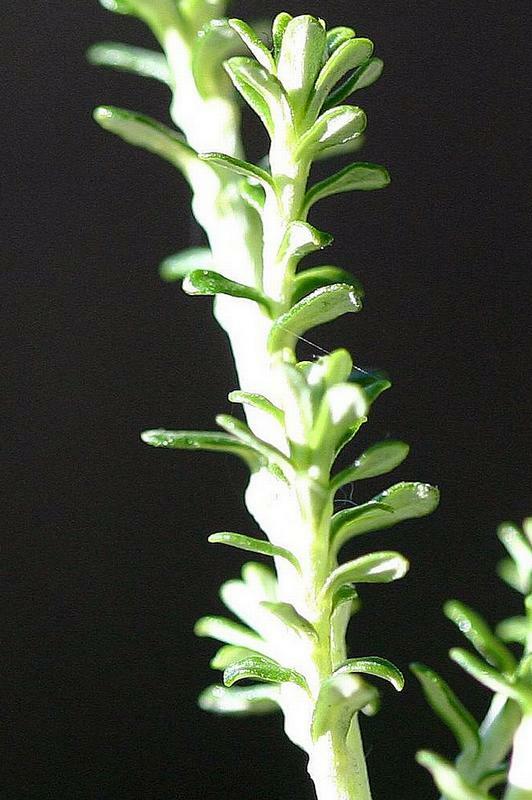 Also check the New Zealand Plant Conservation Website and Flora of New Zealand. Plant Phytography blog Phytography(Gr. phyton: plant; grapho: to write) The branch of botany that deals with the descriptive terminology of plants and their parts. 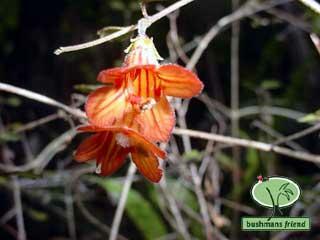 It provides the vocabulary for plant description, identification, and classification. This site presents a daily botanical term with an explanation of the word, its meaning and a photograph that demonstrates the term. 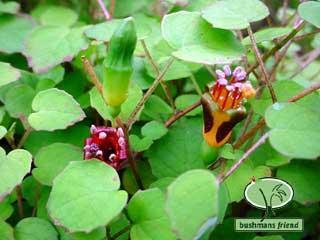 All photos are New Zealand native plants. Schefflera digitata Pate. Found in damp parts of the forest. 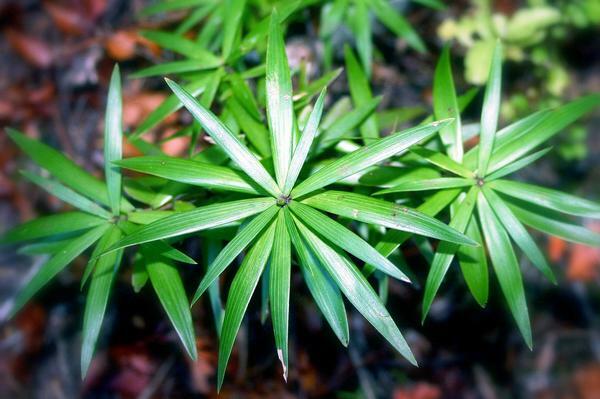 Leaves are softer and more toothed than Pseudopanax. Leaflets 7-18 cm long. Pseudopanax gilliesii Three fingered five finger. 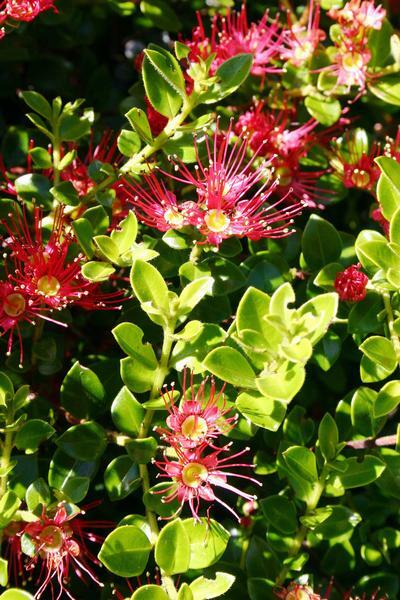 Shrub to 5 m. Endemic to Whangaroa and Little Barrier Island. 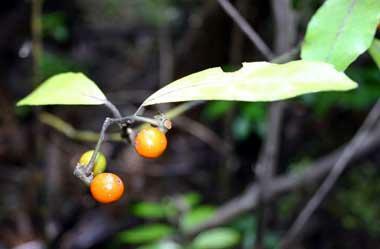 Pseudopanax arboreus. Five finger. 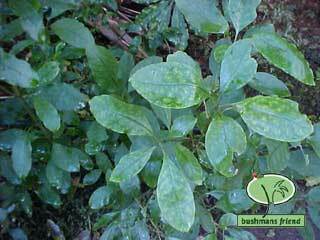 Leaves 3-8 foliate leaflets 7-20 cm long.A small tree or shrub reaching 8 metres. 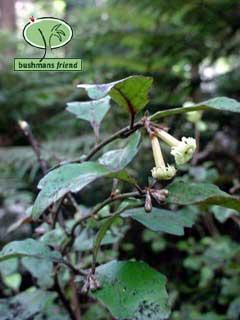 Found in lowland Forests throughout NZ. Flowers and berries in umbels. Pseudopanax lessonii Houpara Coastal Five finger. 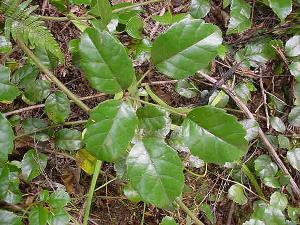 Shrub to 7 m. Leaves 3-5 foliolate. Leaflets 8-10cm. Note the very long petiole. North Cape to Poverty Bay. 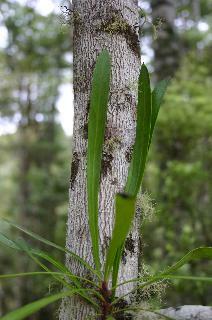 Melicope ternata Wharangi. Shrub or small tree reaching 8 m. 3 foliolate. North Island near the coast. 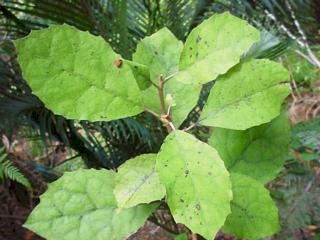 Elatostema rugosum Parataniwha. Leaflets 5-13 cm long reddish green. Soft stems. Common in damp groun. 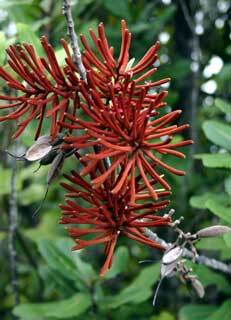 Plant to .5m high. Hibiscus trionum Leaves trifoliate 4-10 cm. Obvious flowers. 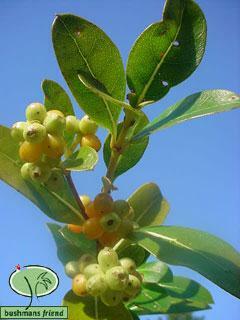 Possibly introduced by early settlers and not native. 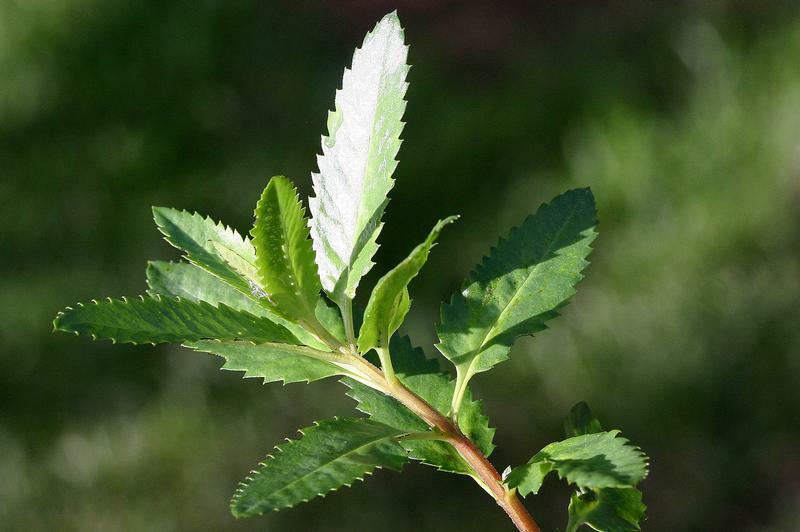 Shrubs with simple leaves longer than 2cm. 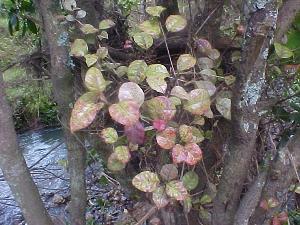 Aristotelia serrata Wineberry Makomako. 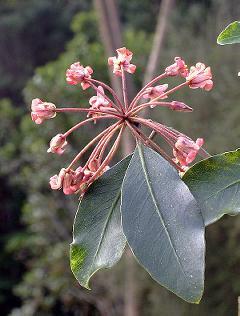 Shrub or small tree reaching 9 m. Leaves 5-12cm long with a long petiole. Blade of leaf broad, rose coloured below. Flowers red-white. Berry 6-9mm; black. Hedycarya arborea Porokaiwhiri Pigeonwood. Leaves opposite 5-12 cm long. Three Kings to Banks Peninsula. Haloragis erecta A shrub of scrublands. Often weedy. Note 4 angled stem and leaves with strongly serrate margins. Coprosma grandifolia syn. 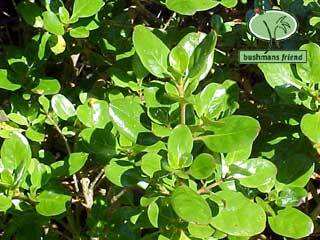 Coprosma australis Raurekau Leaves 10-22 cm long, dull green or mottled. 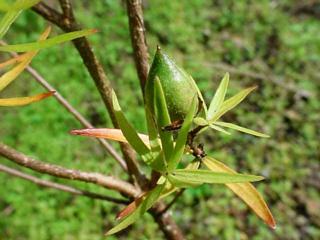 Shrub or small tree reaching 7m. Coprosma lucida Karamu leaves 5-12 cm long. Shrub reaching 5m. Leaves bright green,glossy,thick. 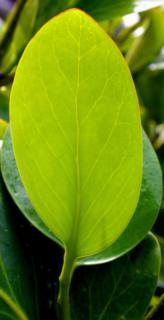 Coprosma repens Taupata leaves 2.5- 7.5 cm long shiny green and glossy. Shrub reaching 8m. Often prostrate. Coastal. Copros ma robusta Karamu. 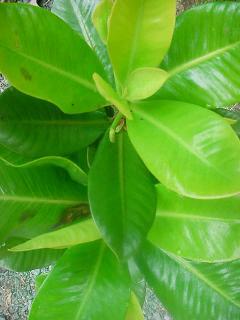 leaves 5-12 cm long, brownish green, thick. Scruffy shrub to 5m. 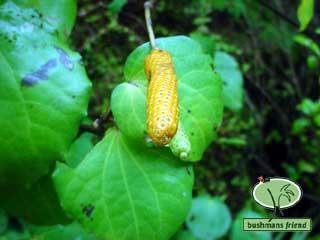 Macropiper excelsum Kawakawa. Leaves 5-12 cm. long. Aromatic. North island and south to Banks Peninsula. 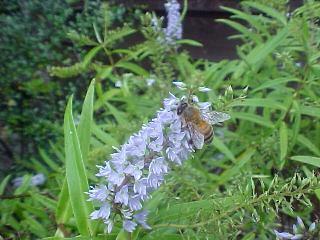 Hebe stricta Korimiko. Leaves 5-10 cm. long. Flowers white or mauve, longer than the leaf. North Island and Marlborough. 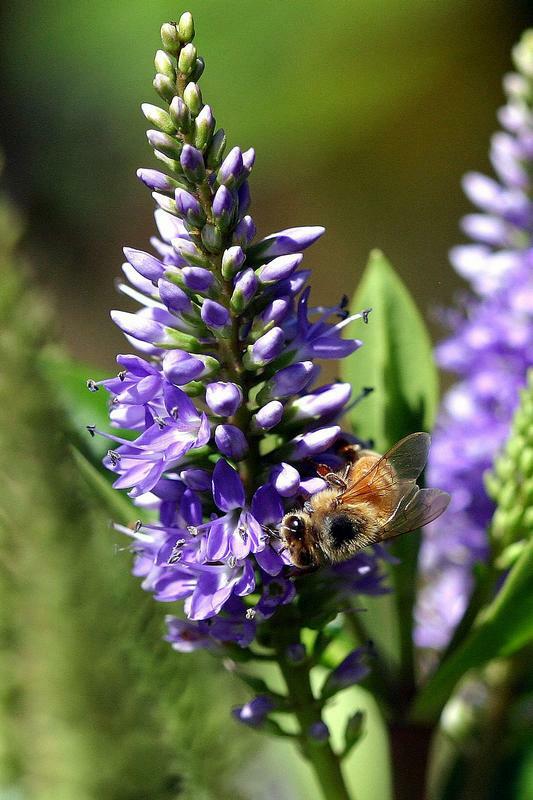 Hebe speciosa. 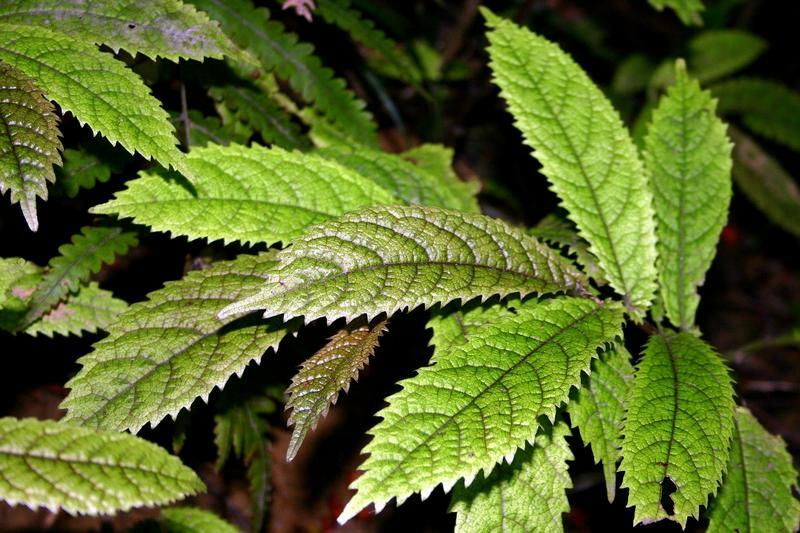 Leaves 4-8 cm. long and broad. Leaf glossy top and bottom. 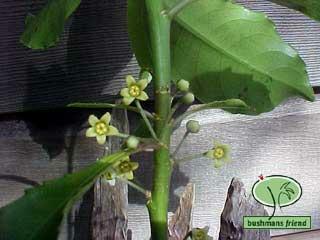 Geniostoma ligustrifolium Hangehange. Shrub reaching 4m. 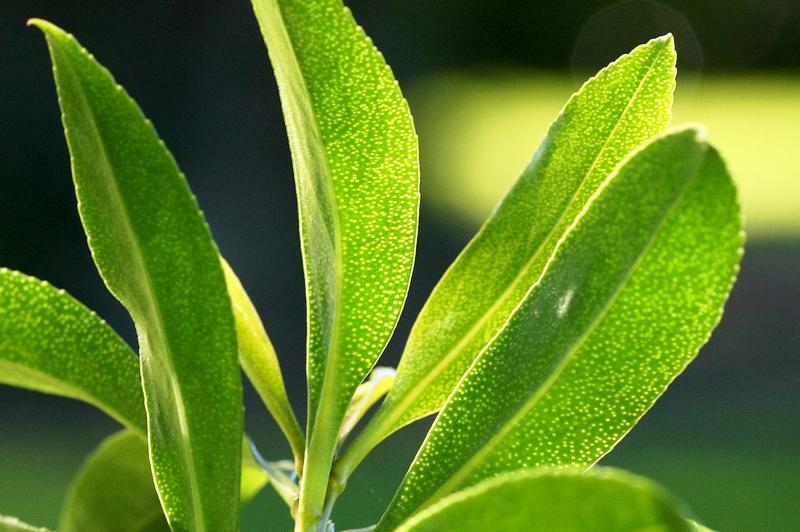 Leaves 4-8 cm soft and shiny green. North Island to Marlborough. Coriaria arborea. Tataramoa, Tutu. Leaves 3-10cm long,oval. 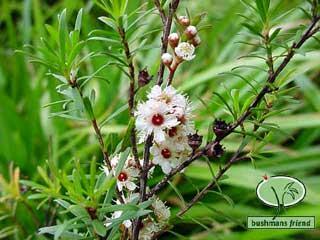 Shrub to 8 m. Forest and scrub on disturbed soils. Throughout NZ. 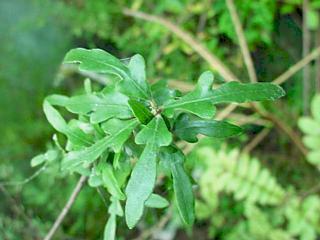 Olearia furfuracea Leaves 5-10cm. long, obscurely toothed. North cape to the Ruahines. 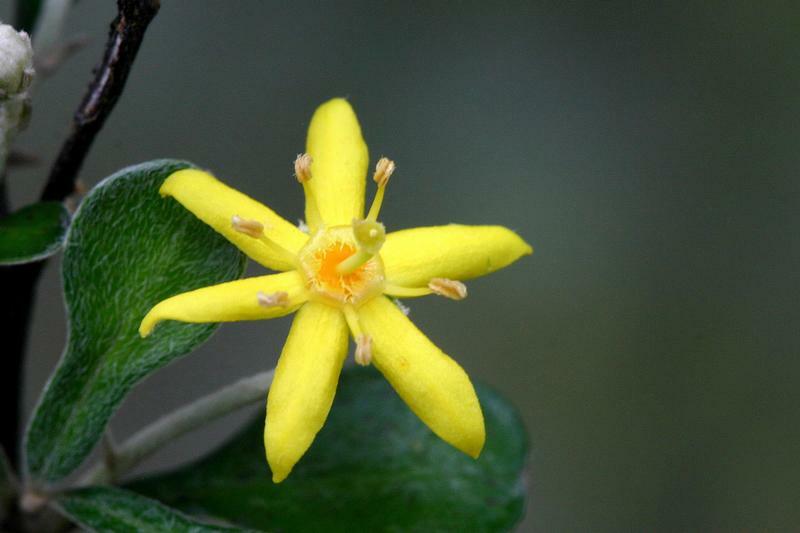 Olearia rani Heketara. Shrub to 7m. Red veins and midribs. North cape to Nelson. 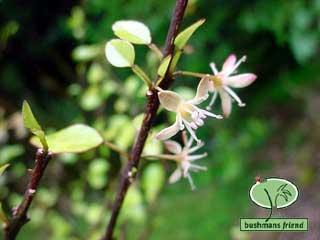 Hoheria populnea Lacebark Houhere. 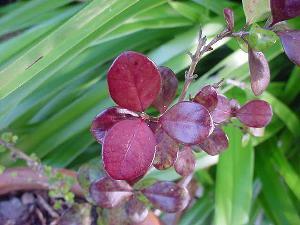 Leaves 5-12 cm long, often purplish beneath. Flowers white. North Cape to Waikato. 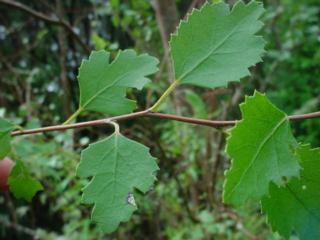 Hoheria glabrata Leaves 5-12 cm long. 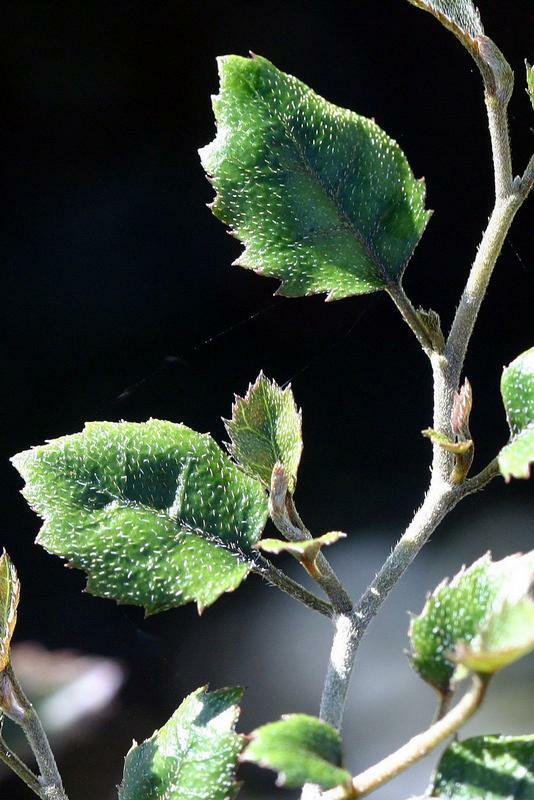 Small tree or shrub to 10m.Western side of South Island. 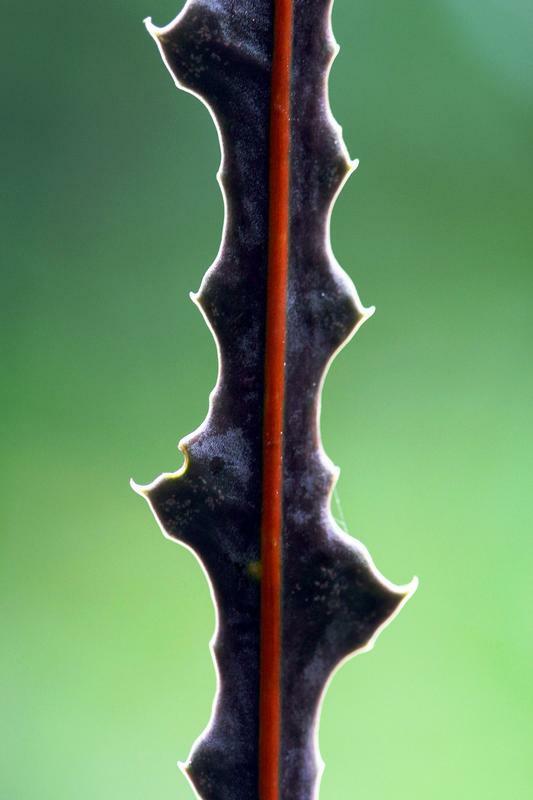 Colensoa physaloides Koru. 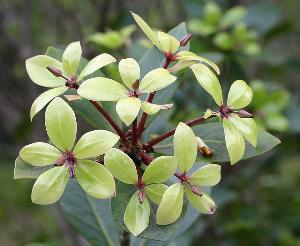 Shrub to 1.5 m. Leaves 8-18 cm, similar in leaf shape to an Hydrangea. Soft and tender. Flowers and berries purple or violet. North of Whangarei. Melicytus macrophyllus Large leaved Mahoe. 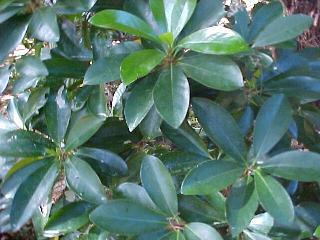 Shrub reaching 6 m. Glossy leaves 7-15 cm long. Kaitaia to Dunedin. 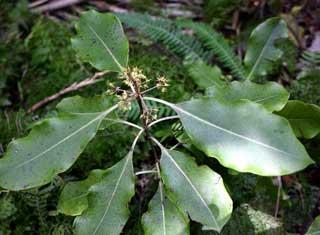 Melicytus ramiflorus Mahoe Whiteywood. Leaves 5-12 cm. long. 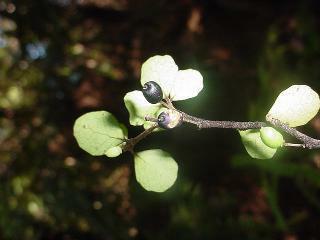 Shrub or small tree reaching 10 m. Lowland forest throughout NZ. 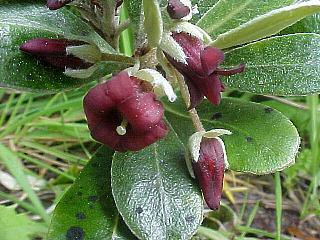 Myoporum laetum Ngaio. 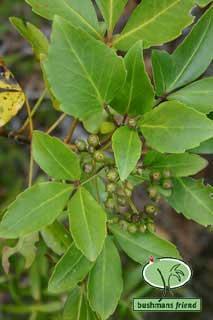 A shrub or small tree reaching 8 m. Leaves 3-10 cm. long. with small spotted glands. White flowers. Purple berries. 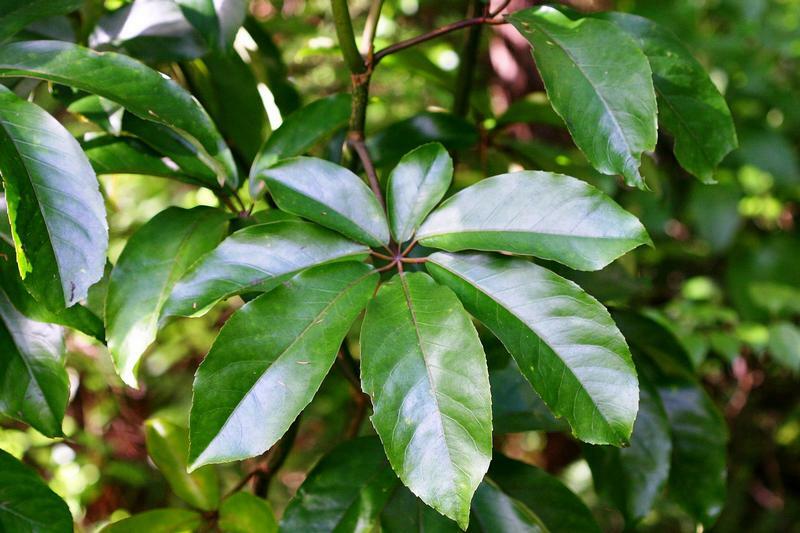 Pseudopanax ferox Savage leaved lancewood. 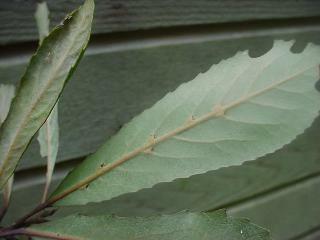 Leaves 7-15 cm. long. Small tree reaching 7m. 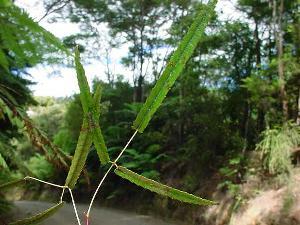 Pseudopanax crassifolium Horoeka Lancewood. Leaves 7-20 cm. long. 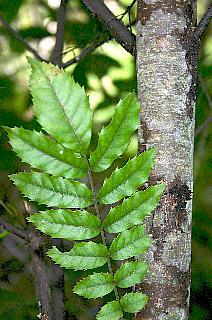 Tree reaching 13 m. Distinctive juvenile form with leaves 15-30 cm long. Auckland to Stewart Island. Picture is of adult form. 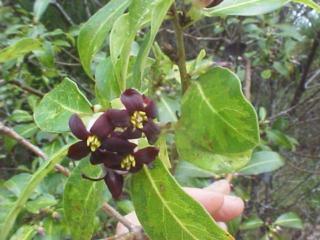 Dodonaea viscosa Akeake NZ Hop Bush. 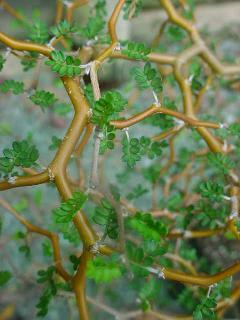 Shrub or small tree reaching 10 m. Leaves 2-10 cm. Northcape to Greymouth. Prefers dry spots. Pisonia brunonnianum Parapara. 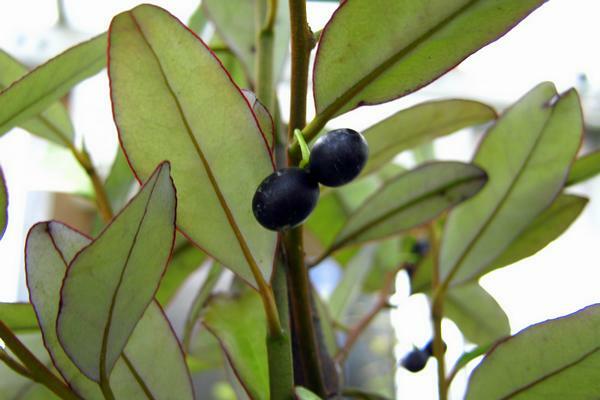 Small tree or shrub reaching 10m. Leaves 10-40cm long, glossy green. 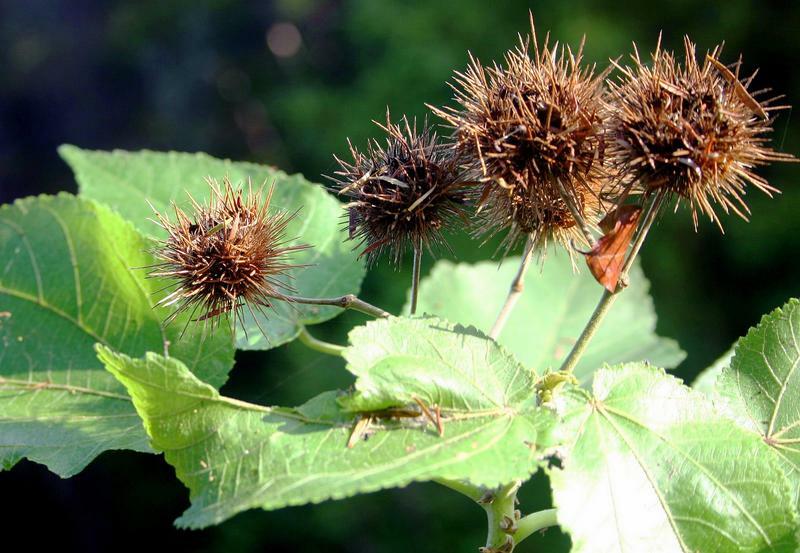 Sticky seeds 3-5 cm long that may trap small birds and insects. Three Kings to East Cape. Fuchsia excorticata Tree Fuchsia Kotukutuku. 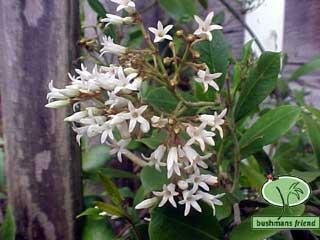 A deciduous shrub or small tree to 10 m. Leaves 3-12cm long and slender. Flowers red or purple, 2-3 cm long. Berry 1-1.5 cm long, purplish black. Mida salicifolia MaireSmall tree or shrub. Leaves 7-12 cm long , variable in width. Lowland forests of the North Island. Elingamita johnsonii Shrub to 6 m.From west island on the Three Kings this plant is becoming more common in Northern gardens. Grisilinia lucida Puka. 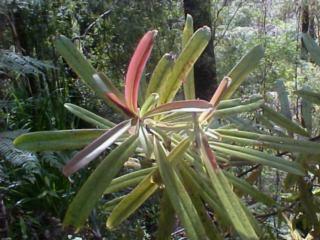 Shrub reaching 8m., often an epiphyte on tall trees. Berry 8mm. long, dark purple. 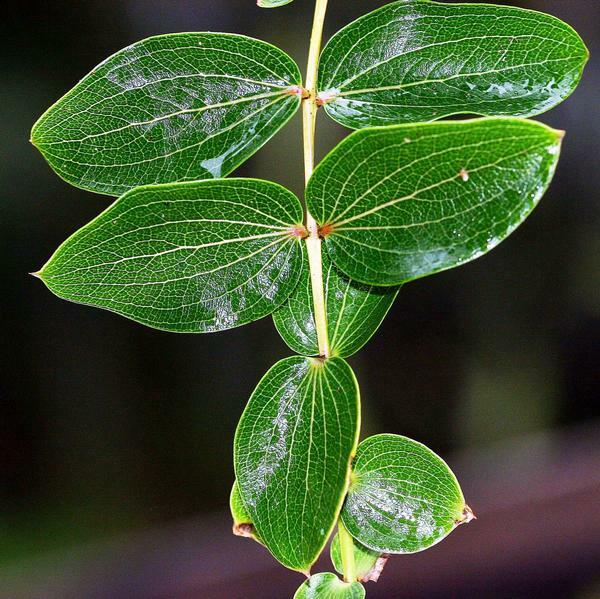 Grisilinia litoralis Kapuka Broadleaf. Leaves 2-10cm long and assymetrical. Berry 6mm long black. Pomaderris kumerahou Kumerahou, Gumdiggers soap. Leaves 5-8cm. long with prominent veins and midribs. A shrub to 3m. Flowers numerous and bright yellow in spring. North cape to Bay of Plenty. Pittosporum colensoi Mountain Pittosporum. Similar to Pitto. 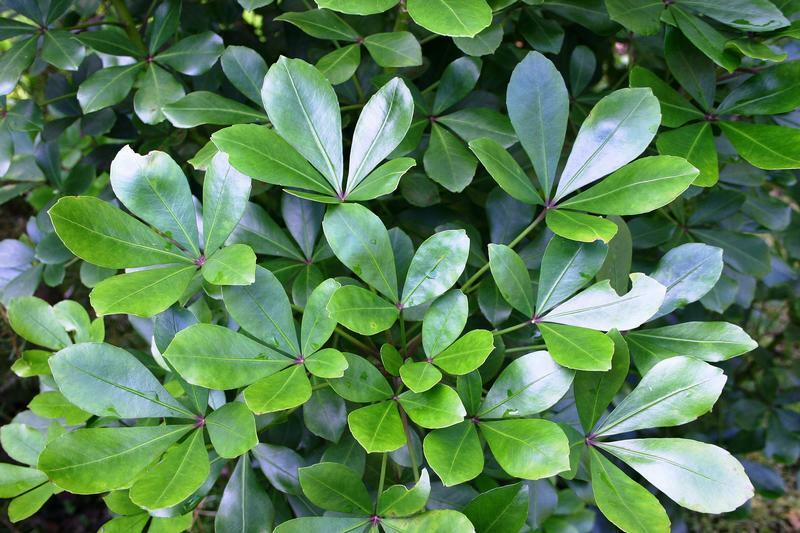 tenuifolium but with larger and glossier leaf. Found in alpine regions. 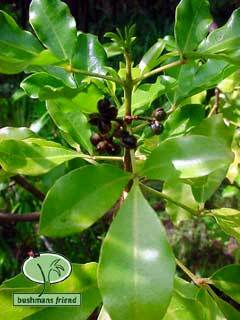 Pittosporum crassifolium Karo. 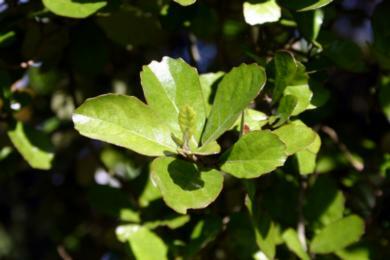 Coastal Pittosporum. 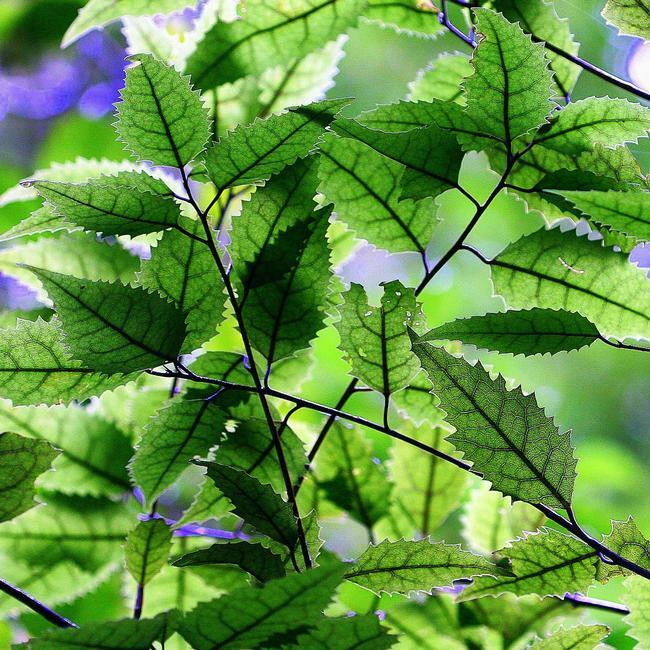 Leaves 5-12 cm. Leathery and hairy on the underside. Kunzea ericoides Kanuka White tea tree. 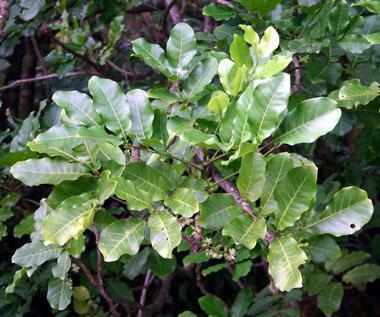 Shrub or tree reaching 16m. Bark thin, peels in strips. Leaves narrow and linear, 5-15 mm. Soft to touch. Small white flowers in bunches, late spring. Fruit a capsule to 5mm. Found in shrubland throughout NZ. 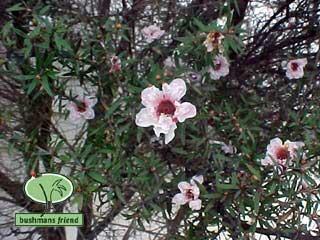 Leptospermum scoparium Manuka Red tea tree. 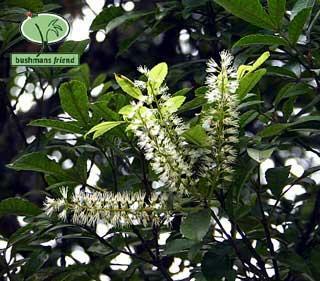 Shrub or small tree reaching 8m. Leaves 1cm, pungent and pricks hand on touch. Flowers early spring 6-12 mm long, singular. 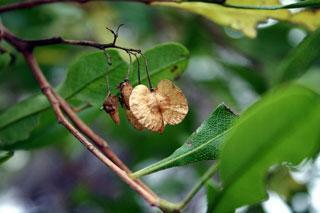 Fruit a woody capsule 8-12mm. Found in shrubland throughout NZ. Linum monogynum NZ Linum. Shrub to 1 m. Leaves bue/green. Tough fibrous stems, difficult to break by hand. White flowers. 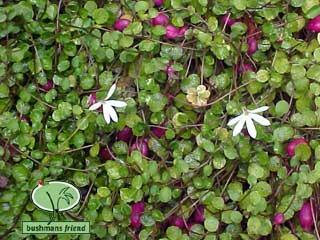 Hymenanthera microphylla. 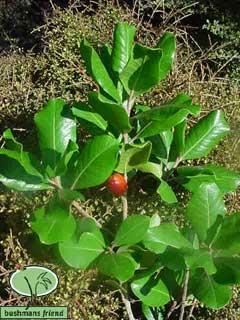 Thick leaved and leathery 5-12mm White berry 1cm. 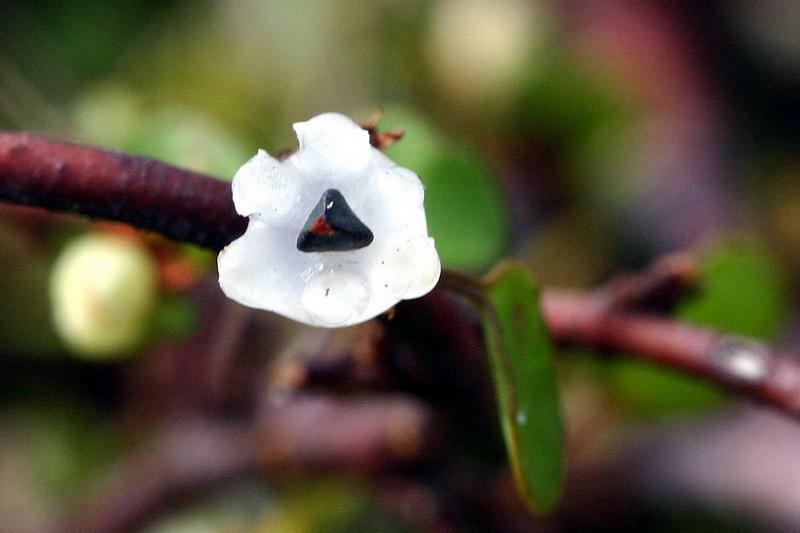 Found in coastal scrub Cook Strait and Banks Peninsula. Leucopogon fasiculata Mingimingi Leaves 1-2.5 cm long and arranged in bundles or whorls. 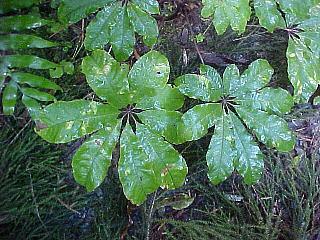 Juvenile form with larger leaves. Shrub reaching 5m. Often found in dry spots North cape to Canterbury. Lophomyrtus pedunculata Rohutu Leaves 6-12 mm long red and oval. Bay of Islands and south. Lophomyrtus bullata Ramarama Leaves1-3cm long swollen or blistered between the veins. Sometimes reddish. Shrub reaching 8m. Berry 1cm long dark red to black. Cassinia leptophylla syn.Ozothamnus leptophyllus Tauhinu Leaves 2-3mm long, glaucous, crowded on stem, margin folded under. Pratia angulata Ground Hugging herb found from Auckland south in shadey spots. 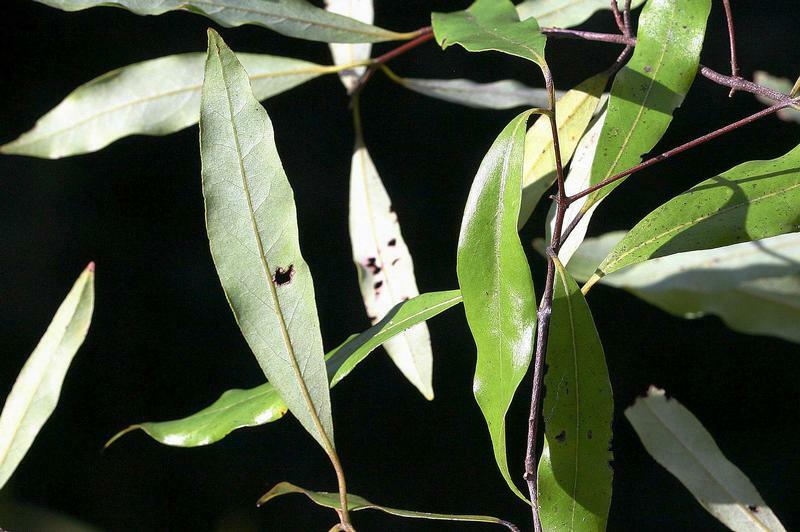 Melicope simplex Leaves 1-2cm long, winged petiole. 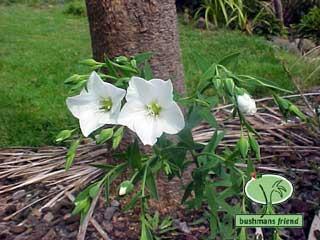 Shrub reaching 4 m.
Clematis paniculata Puawhananga.Large woody climber with 5-10cm flowers, very showy. Forests throughout NZ. 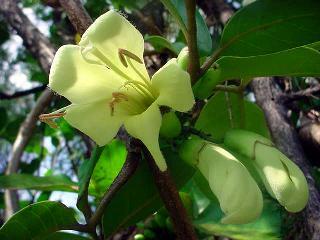 Tecomanthe speciosa Large vigorous climber. Endemic to Three Kings Islands although common in northern gardens. 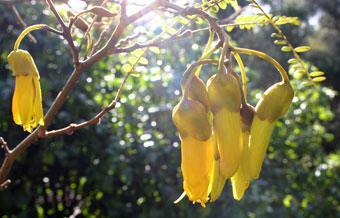 Large pendulous yellow-creamy flowers. Rubus schmidelioides. Bush Lawyer. Leaves 5-12 cm long and toothed. Rubus australis Bush lawyer. leaves 5-10 cm long oval, serrated. Prickles reddish. Fruit 8mm in diameter, yellow to red. Metrosideros perforata Small white rata. Climber. 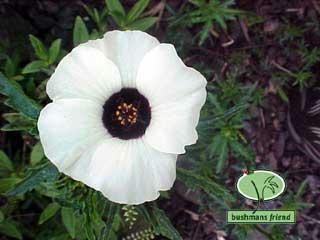 White showy flowers in autumn. Parsonsia heterophylla Native Jasmine. Kaihua. Opposite leaves 5-10cm. 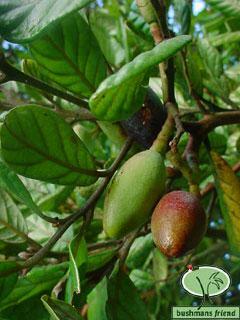 The fruit is a long narrow pod which opens to release the tufted seeds. Small but obvious white flowers. 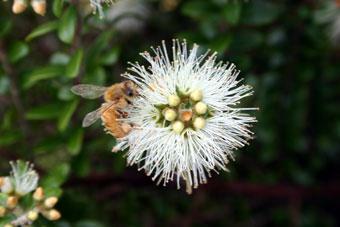 Metrosideros carminea. Leaves 1.5-3cm long. Carmine red flowers. Mangonui to East Cape. Pennantia corymbosa Kaikomako A tree reaching 12 m. Has a juvenile divaricating form with interlacing twigs and branches. Leaves 3-10cm irregularly toothed. 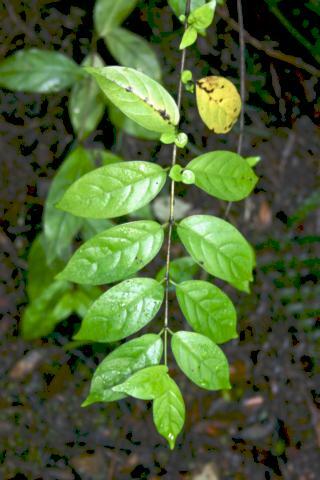 Adult leaves shown here. Fruit a small black drupe. 8mm long. Carpodetus serrata Putaputaweta. Leaves 2-5 cm long, smaller when young as shown here. Yellowish blotches on older leaves. Zig zagging branches. 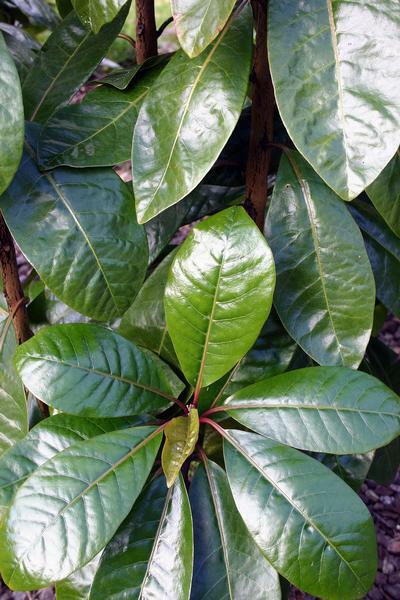 Knightia excelsa Rewarewa Tree reaching 30 m. Leaves 10-15 cm, coarsely toothed. Flowers velvety red and yellow. Fruit like a canoe 4-6cm. Common tree of ridges and dry spots. North cape to Marlborough. 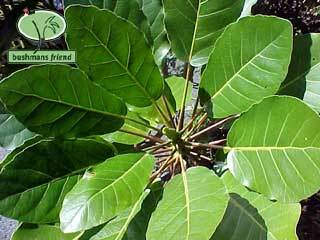 Toronia toru Toru Tree reaching 15m.Leaves 8-12 cm long with a red petiole. Fruit a pungent purple berry. North Cape to East Cape on dry ridges. Corynocarpus laevigatus Karaka Tree reaching 18m. 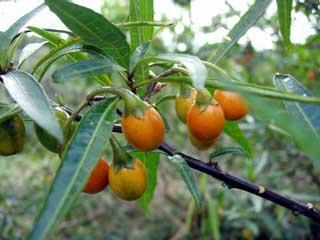 Leaves 7-30cm long, thick glossy.Berry orange colour 3-4 cm long. North cape to Westland. 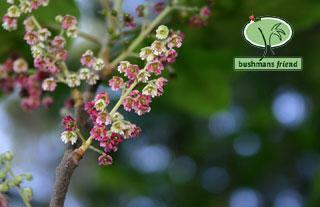 Beilschmiedia tarairi Taraire Common tree to 25 m of Northern lowland coastal forests. Blue underside to leaf. Leaf to 10cm x 6cm. Berry a purple drupe 2-5 cm. long. 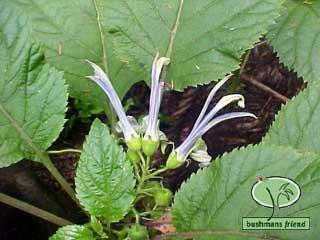 Beilschmiedia tawa Tawa Leaves 5-10 cm long, thin, dull blue on underside, yellowish green above. Berry 2.5cm long dark purple. 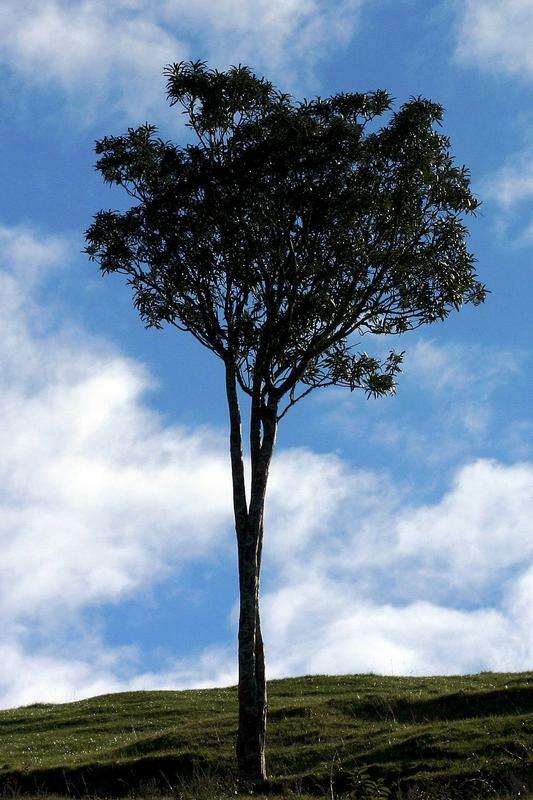 Tall tree of Northern forest reaching 25 metres. 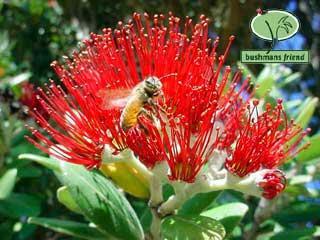 Metrosideros excelsa pohutukawa NZ Christmas tree. Tree reaching 25m. 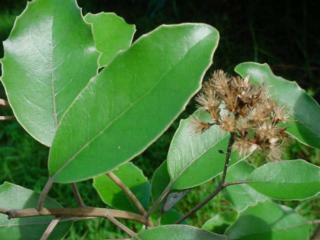 Leaves2-10cm long, leathery and with a hairy underside. Planchonella costata Tawapou Tree reaching 20m. Leaves 5-10 cm long, shining green. 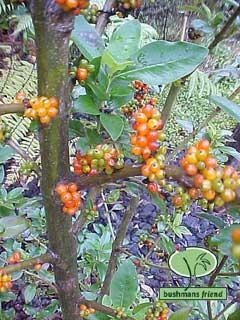 Red berry 2.5-4cm long,of 2or3 hard banana shaped seeds. Found on coastal headlands Northcape to Opotiki. 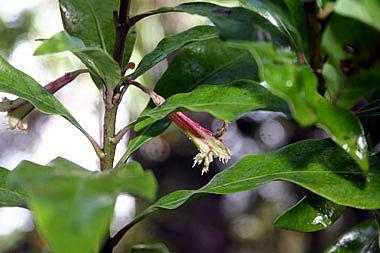 Weinmannia silvicola Towai, Tawhero . Leaves 10-12 cm long 3 -5 foliate. Found from Bombay Hills North. Dull white flowers. 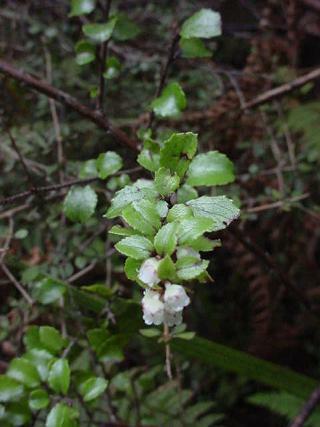 Dysoxylum spectabile kohekohe. Tall forest tree to 25m.